This is one of my favorite sweets these days. My favorite orange color attracts me to these ladoo i guess. i was quite determined to make this motichoor ladoo for this diwali. it was decided last diwali itself. i was searching for boondhi laddle with small holes for the past one year. i could not find it. compromising it, i made these motichoor ladoo with my normal boondhi laddle. 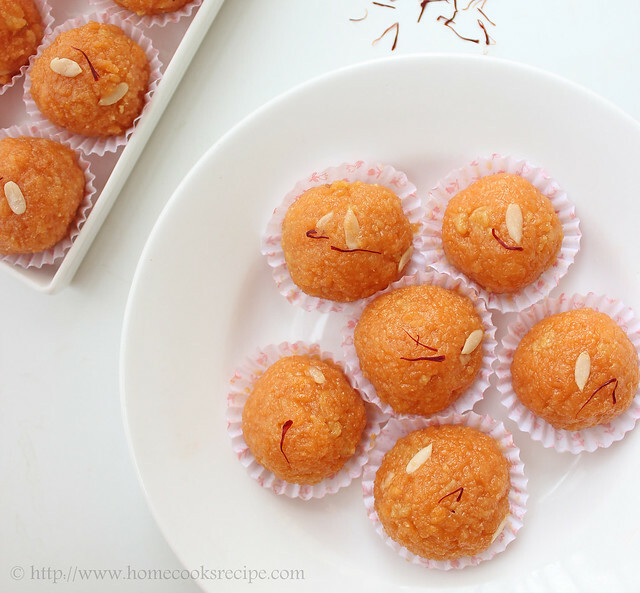 check my boondhi laddu recipe, to know about the boondhi laddle and the other laddle's needed to make these motichoor ladoo. As i normally believe, one who eats enjoying the taste of the dish can be a good cook. I have enjoyed eating these motochoor ladoo in different sweet shops. i found a slight difference between the ladoo in sri mithai sweet shop and other shops. later i identified mawa/koya is added to the ladoo, which gives a rich deliciousness to the ladoo. First time, i became over enthusiastic and added more khoya to the boondis. then i prepared again correcting the mistake that i made first time. so it is advisable to add 1/4 cup of khoya for 1 cup of besan flour. If you are beginner in making ladoo, first try with half cup of besan flour. for half cup of besan flour add 1/4 cup of water little by little to get thick batter. then you can 1 or 2 tsp of water to bring it to dosa batter consistency. for the sugar syrup, add half cup sugar and 1/4 cup water. sugar syrup should be of one thread consistency. Sugar - 1 cup (250 gms) use good quality of sugar like parry's sugar. Sieve the besan flour well with baking soda and with orange red color. Mix the besan flour with 3/4 cup of water. sieve it again to avoid any lumps. batter should be little thicker like dosa batter. Heat 1 cup of oil in a pan. drop a small drop of besan batter in oil to check whether it rises in the oil soon after it is dropped. Bring the boondhi laddle just 3 or 4 inches above the oil. take besan batter in a laddle and spread over the boondhi laddle. lightly tap the boondhi laddle so that the boondhi's easily fall off into the oil. It just takes less than a minute for the boondhi's to get fried for ladoo. remember that the boondis should be taken off from oil, before it turns crispier. soon after the oil stop sizzling, remove the boondhi to a strainer or to a kitchen tissue paper to drain off the exccess oil. for the next batch, wash the boondi latter in water and wipe it with a clean kitchen towel. likewise make boondis and wash the laddle after every batch to avoid the tails in boondi. Now to prepare the sugar syrup, by heating a pan with 1 cup of sugar and 1/2 cup of water. stir well to dissolve the sugar. filter the dissolved sugar syrup and let it boil again to attain one thread consistency in sugar syrup. add a small dot sized orange food color to the syrup. switch off the flame. Mix the prepared boondi with sugar syrup. mix well so that all the boondis are coated in sugar syrup. Separate 3 tbsp of boondi aside and grind the remaining in your mixer with just 1 tsp of boiling water. just give a pulse. if you grind too much, it may not be easy to shape the ladoos. Now mix the grounded boondis with whole boondis. Dry roast the melon seeds and add it to the boondi. grate 1/4 cup of khoya and add to the boondi. Mix the boondi and khoya together. mix well and start shaping the ladoos. if preferred, smear little ghee on your palms and shape the ladoos and place it on butter paper or on a small cup cake liner for the first few hours. 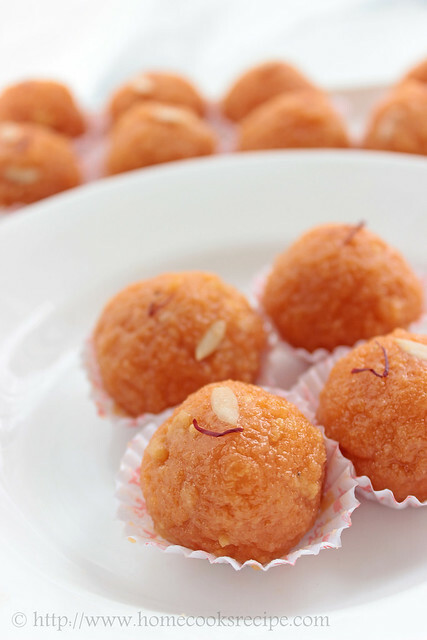 Garnish each ladoo with melon seeds and saffron. Serve these Orange Beauties to your family and loved ones. I am sure they will enjoy as our family did. Since khoya is added to these ladoo, it should be refrigerated. it keeps well under refrigeration for up to a week. Adding khoya is optional. but the taste it leaves on your tongue after having one ladoo is just out of the world. 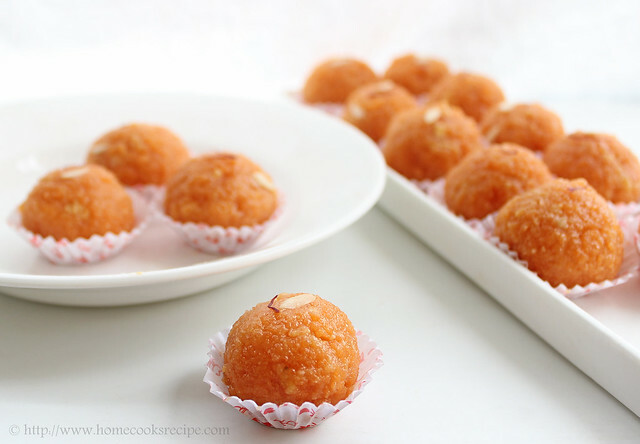 Shaping ladoo is not difficult, if the sugar syrup is prepared in the ratio of 1 cup of suagr for 1/2 cup of water. remember the ratio for 1 cup besan flour is 1 cup of sugar. Traditionally milk is added to the besan flour for preparing boondis. Do you like this recipe and picture? 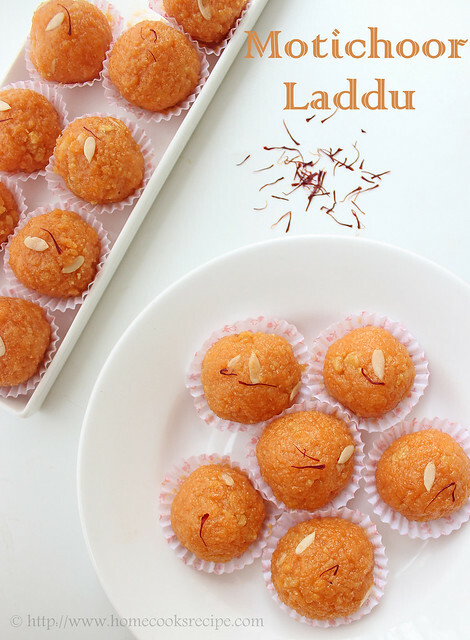 please leave me a line to make me smile, as it was a tough task to try these ladoos twice and click step wise pictures with one hand cooking and one hand clicking pictures to share with you all..
Mothichoor ladoo looks really yumm. You made it beautifully. 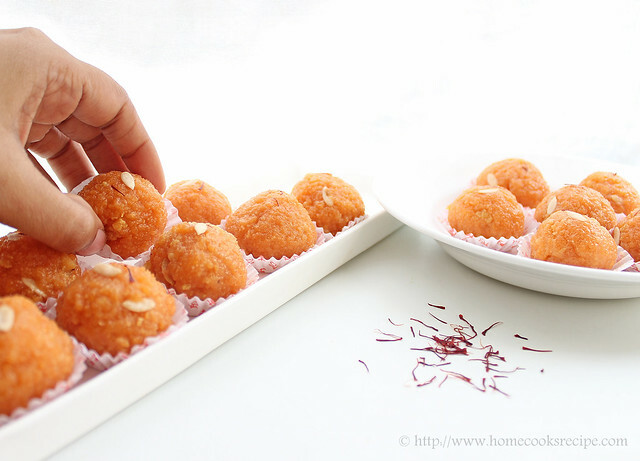 simply awesome ladoos. pics are amazing. Feel like trying it right now.looking yummy! My favourite ladoo .Perfect ladoos . Wounderful pics . I am a great ladoo fan and urs looks so professional lavi. looks so festive and delicious, awesome clicks! They looks just stunning, i love these laddoos very much. Beautiful,yummy,mouth watering...hats off to the hard work and keep up the great work.. I have made it. It's perfect & awesome. Thanks for such wonderful dish.